Patch Tesselation is a technique to increase in real time the number of triangles of a mesh. The principle is to use a coarse mesh at the CPU level and to add detail on-the-fly at the GPU level. 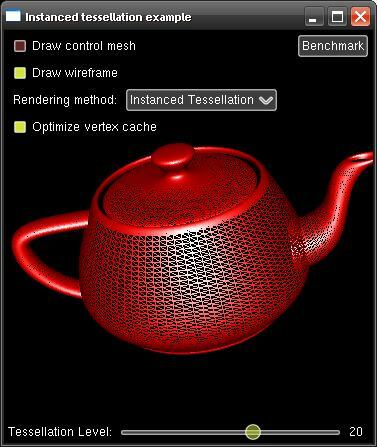 The detail is added using a tesselation patch called refinement pattern and for each triangle of the coarse mesh the refinement pattern is rendered. Refinement pattern has the same shape than a single triangle of the coarse mesh but has a variable number of triangles according to the appropriate level-of-detail. 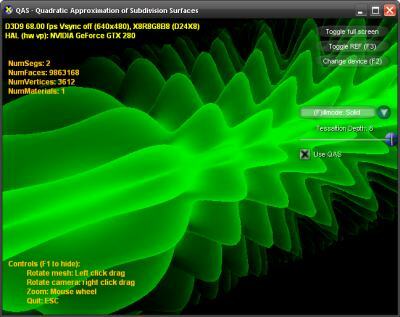 Hello, the Opengl one is great, and i try the version in Nvidia’s SDK, but where the GUI come from? It’s attracting. Hi, I am glad that I stumbbled upon this great site. I am wondering if this could be implemented in D3D 9 hardware. And is rendering using RF in place of the course cage simple enough to be done in shader IDEs like renderMonkey?